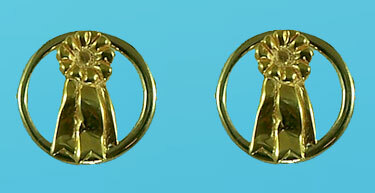 Ribbon Earrings, the Gorgeous Horse is your number one source for custom equestrian jewelry. Check out these cool ribbons in frame. There's no better symbol for your hard work than a nice blue ribbon, but how about a really nice solid gold one as tribute to your many accomplishments. Check out all of our other ribbon designs as well, you can never have too many ribbons, right? Dimensions: 1/2 inch in diameter.